Cimcool Centre Saver® is a waterproof grease designed as a lubricant for centers on lathes, grinders, hobbing machines, etc. It also lubricates and waterproofs bearings, pumps, and tools. It can be used on ferrous and nonferrous metals such as Aluminum, Cast Iron, Carbon Steels, High Speed Steel, High Alloy Steels, Stainless Steels, Copper, Brass, Bronze. It is not recommended for use with parts made from magnesium or magnesium alloys. 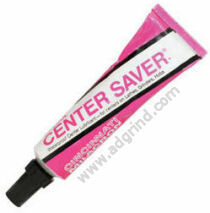 Using Cimcool Centre Saver® reduces wear on your centres. The extreme pressure (EP) lubrication reduces the friction between the workpiece and the center thus reducing wear and prevents seizing of machine tool screws and fixtures. This 80g pack of Pattex Stabilit Express is a fast setting two-component adhesive that fills gaps and is Silicone free. It is suitable for a wide range of materials including: - stone, all metals, wood, ceramic, porcelain, glass, concrete, acrylic, polystyrene, ABS and SAN plastics, hard PVC, polycarbonate, glass fiber reinforced plastics (GRP), amino and phenolic resins and cellulose acetobutyrate It is not suitable for use on soft PVC foams, PE, PP, Teflon and polyamides. Easy installation, driven by compressed air and capable of pumping up to 200 Litres in less than 4 minutes. The Nimatic NRC-200 Reversible Cleaner is and easy to use vacuum cleaning system for emptying, cleaning and re-filling liquid tanks like coolant systems on your machine tools. Simple to fit onto a standard 208 Litre barrel and easy to operate. It is driven with compressed air and is tested and set to a maximum safety pressure (in the drum) of 0.25 Bar, with a running pressure of 2 Bar. If you would like more information on any of the accessories and equipment then please contact us. You can also download brochures and information sheets by following the link below.